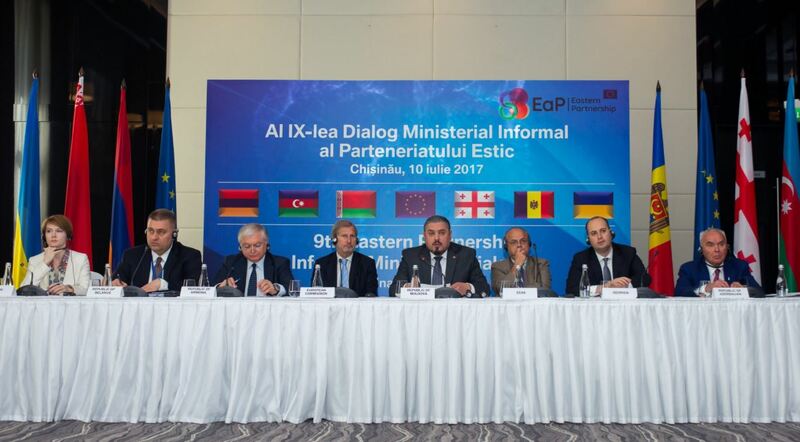 On 10 July 2017, the Eastern Partnership Civil Society Forum participated in the 9th Eastern Partnership Informal Partnership Dialogue in Chisinau, represented by Ina Coseru, member of the EaP CSF Steering Committee and Coordinator of the Working Group 3 on Environment, Climate Change and Energy Security. The event gathered Ministers of Foreign Affairs and Ministers in charge of energy efficiency of the six EaP countries, as well as the European Commissioner for Neighborhood Policy and Enlargement Negotiations Johannes Hahn, the European Commission’s Director General for Energy Dominique Ristori, and the Deputy Secretary General of the European External Action Service Jean-Christophe Belliard. Ina Coseru was invited to open the floor by the chair of the meeting, the Deputy Prime-Minister of Moldova, Andrei Galbur. In her speech, she first outlined the recent positive achievements in EaP region, while also addressing general EaP policy issues such as human rights protection, political and economic interference of Russian authorities in the region, integration processes, energy security, and environmental governance. She called on the EU to keep the EaP policy high on its agenda and hold governments fully accountable, applying conditionality when necessary. In the same vein, Ina Coseru urged the authorities from the six EaP countries to respect the fundamental freedoms and human rights, end political prosecutions, tackle corruption and further engage with civil society. In the second part of her address, Ina Coseru presented the issues related to the energy efficiency policy, providing a brief overview of the legislation recently adopted in the six EaP countries, and its implementation. She highlighted the importance of promoting co-generation (simultaneous production of electricity and heat) in the EaP region, in order to improve energy efficiency and drastically reduce environmental pollution, thus stressing the need for enhanced legal and technical capacity in the EaP countries.